I'm taking a blogging break right now, but I thought I'd leave you with a little quote from Henri Matisse. I used to be sooooooooo afraid to share creative things. I don't think I've ever been afraid to create things on my own, it's the sharing it that can be scary. I was afraid to start a blog and almost terrified to open an Etsy shop. What if I failed and no one liked my stuff? I remember one time writing down a list of 100 things I wanted to do before I died (guess that's called a bucket list now, but this was before that phrase came into being). One thing on my list was to sell one of my paintings. Crazy to remember that I was so scared to share my art that it was my goal to sell just one! I have since faced my fears, sold many paintings, and my little blog here just turned 4! Not everything I have done has been a success and I started out really slow, but it's been an incredible journey. Finding out that I'm actually alright and that there are people out there that like my work. Finding out that I can do scary things and after a while, they turn out to not be so scary anymore. So what's your story? 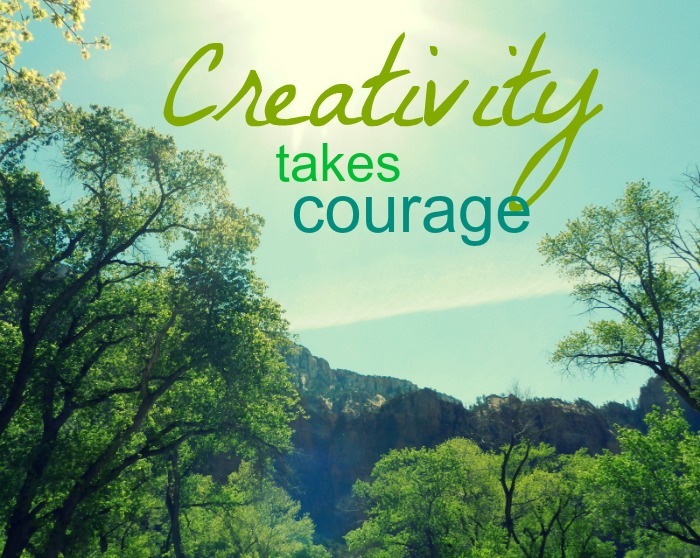 How have you overcome your creative fears? I understand what you mean about being scared to share your creative self. I've been very afraid of what people would think of me if they found out I wrote and that they wouldn't like my writing. I just started a blog where I share a story I'm writing, and I've finally managed to get myself to show some of my friends and family. I hope I'll get more and more courage as I start down this road. Thanks for the post! It's nice to know that other people felt the same way and got through it! Thanks for sharing that Nancy. I think you will get more courage as you go. For me it was a gradual thing. I'm so glad you faced your fears of this and started your blog and etsy shop! I know it's been a great outlet for you and I love seeing the beautiful things you create. I just found you by accident, but I focused immediately on this post. It's about what I'm feeling right now, after more than 3 years of my blog! I hope you come back very soon to tell us how it's going, why I've decided to follow your blog, so maybe I'm able to clarify the ideas too! Good Luck! I'm glad you found me Clara and I'm glad you can relate :) Thanks for your comments!